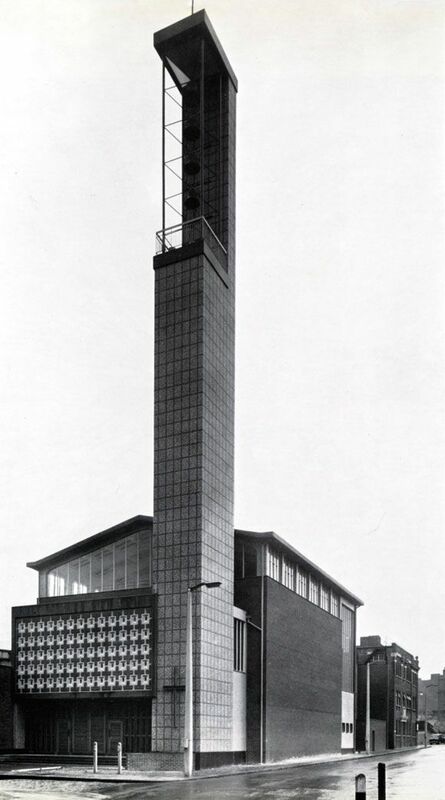 Home > Architecture & Urban Design, London, Things I Like...	> St Boniface’s German Church, Whitechapel. St Boniface’s German Church, Whitechapel. 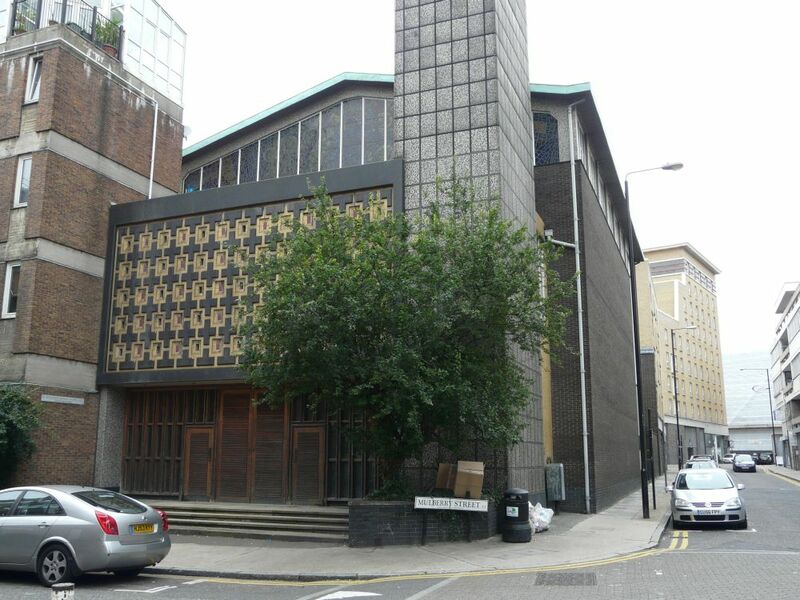 We came across this forgotten and hidden gem again recently, St Boniface’s German RC Church in Whitechapel. The main body of this still unapologetically modern looking building is clad externally in small format silvery grey coloured bricks, whilst the bell tower and feature entrance elements are finished in a variety of beautiful profiled mosaic tiled panels, in yellow, red, white, grey and black, truly one of my most favorite of materials, and one that is criminally underused today. This contemporary black & white photo from the early 1960’s, illustrates the amazing bell tower, with its distinctive cut away top. From what I’ve read, it would appear that the tower had to be to these almost alarming proportions, in order to house the original bells that were salvaged from the previous church. Sadly on the two or three times we’ve been past, the wonderful hardwood timber entrance screens have always been locked, so we’ve never managed to get in. 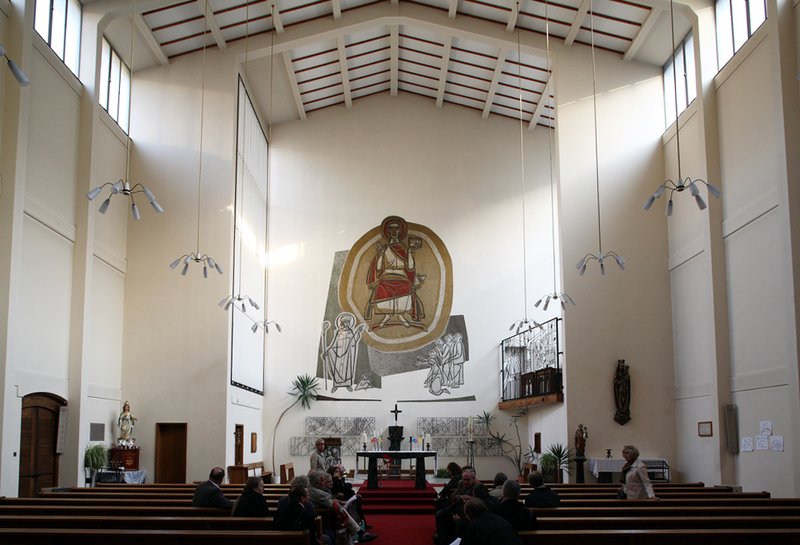 Some borrowed photos from the internet however depict a calm and structurally unambiguous interior, with clean white plastered walls adorned with artworks and images which to my eyes seem very obviously to be contemporaneous with the churches modernist design intentions. Wow! It’s fabulous inside and out. Weird that you would have a German church here so soon after the war & the Jewish presence in the area then too. It’s all different now though. I hadn’t thought of it in those terms, but a bit strange certainly.. I suspect that it has to do with the previous bombed church, probably the same denomination and they just reused the site.. 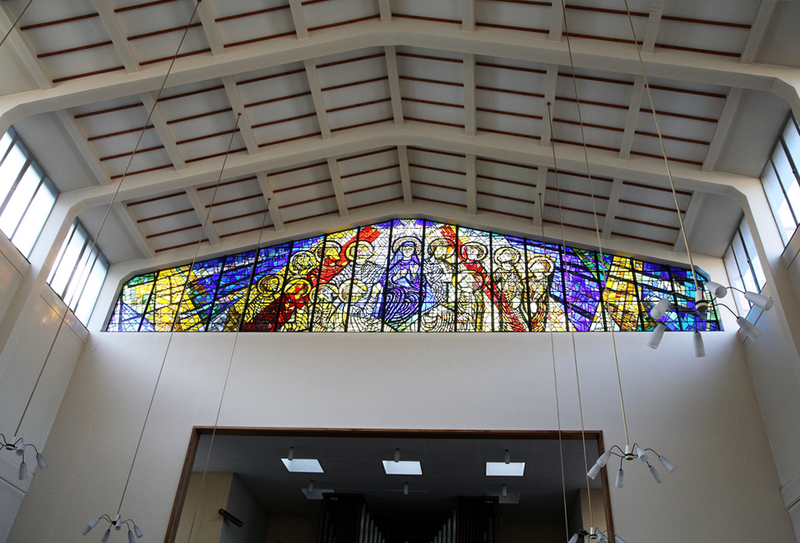 I have applied to get this church listed. Fingers crossed!